1947 to 1953 ( ADVANCED DESIGN ). 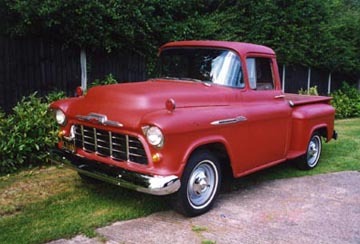 Chevy designation 3100 means ½ ton short bed. Chevy designation 3600 means ¾ ton long bed. 1954 to March 1955 ( FIRST SERIES ). 1957 Basically the same as the previous 1955 - 1956 model. 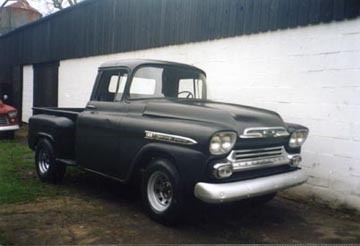 1958 to 1959 (APACHE ). OK - that was a very basic guide to identify the year models. There is a lot more to know but I am stopping here, because I need you to stay awake a little bit longer!!! What is the difference between a ½ ton short bed and a ¾ ton long bed? 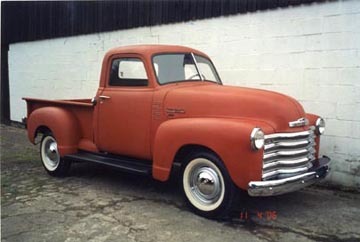 *The short bed is the 3100 model on all years, commonly known as 'the 6 foot bed'. These are the most popular, because generally they fit into a standard size garage. The gear and axle ratios are higher than the ¾ ton long bed, therefore are quicker in standard form. *The long bed 3600 ¾ ton model has a stronger chassis and heavier 8 stud wheels. All ¾ ton models are standard with the floor change 4 speed gearbox. It is approximately 18 inches (46 cms.) longer than the short bed but are commonly known as 'the 8 foot bed'. 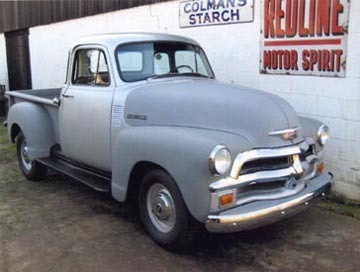 From 1955 there is the 3200 model, which has the same long bed body on the ½ ton running gear. What is the "right" model? There is NO "right" model. Between the specified years, all models rated equally. The only exception being the long bed ¾ ton versions as explained previously. They are not as user friendly as the ½ ton when in original form. 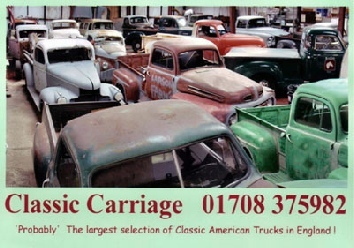 Other issues include the series 1 'five window deluxe cab' or, in the case of the series II, the 'big back window' de-luxe cab. From my experience it is 50/50. Some love it and some don't. My opinion is: buy the model you like and enjoy it. There is a huge parts reproduction market in the USA. 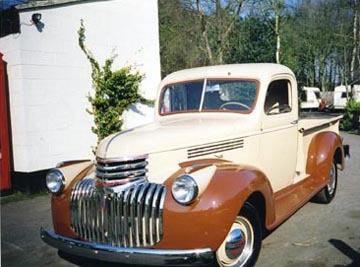 The availability for 1947 to 1959 parts is extremely good. Parts for the 1941 to 1946 models however, are not quite as good but the parts are all out there with a bit of time and effort. Can you take anymore ??? The GMC truck is pretty much a Chevy with the revised GMC front end, although they do use a different size engine. This could now be irrelevant , because most of the GMC trucks have had Chevy engines put in them. 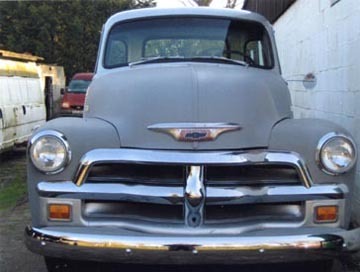 All Chevy and GMC trucks were 6 volt negative earth until 1955 when, with the introduction of the Series II, they went to 12 volts. 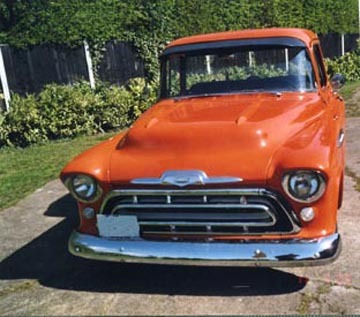 Be aware that the majority of project 6 volt trucks will have had a 12 volt battery put in them with no regard to the electrical system but again, most project trucks will need rewiring and converting to 12 volt anyway. If possible find out which state of the USA the vehicle came from. Dry states i.e. 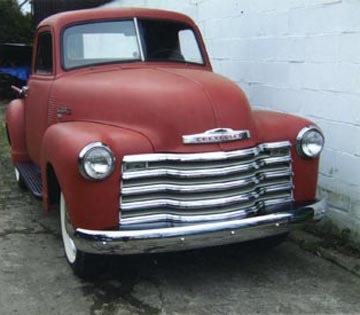 California and Arizona are favourite for rust free vehicles. The East coast i.e. New York, can get as much rust as we do. If the truck in unregistered, then you must obtain from the vendor, a 'US title' plus a 'customs duty paid certificate', which can either be a 'C&E 386' for private imports or a 'C&E 389' for trade imports. While you are checking the paperwork , DO make sure that the chassis or vin number on the paperwork correspond with the chassis plate numbers on the vehicle. NEVER ASSUME THAT IT WILL! 1941 to 1946: Under the bonnet. The plate is screwed to the right hand side of the bulkhead. 1947 to 1955: Open drivers door (left hand side), the plate is screwed to the door shut panel, between the hinges. 1955 to 1959 Series II: Open drivers door (left hand side), the plate is screwed to the door shut panel, at approximately eye level behind the windscreen. I hope this rough guide will be of some use to you in your search for a pickup. Please view my current stock of Chevy trucks, which are offered with all import taxes paid in full and every vehicle is supported with all the necessary paperwork.